Producing fuel from crops—bioenergy—is expected to be a key component in meeting future global energy demands. Because crop productivity is sensitive to climate, researchers wanted to know how climate projections may affect agricultural crop yields. Even with climate impacts, their research shows a prominent role for bioenergy in reducing carbon emissions in energy production. 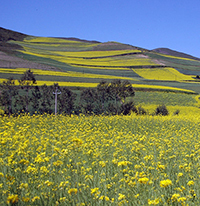 Rapeseed, pictured, is one source of biodiesel. Image courtesy of Creative Commons License. Enlarge image. Results: Snap, crackle, pop might be deterred in the future by climate change, according to research from Pacific Northwest National Laboratory and the Potsdam Institute for Climate Impact Research. In a new link-up of crop and global climate models, and a total-system assessment of possible climate futures, they found that climate change will greatly reduce yields of the world's major grain crops. The blow to grain is especially potent in scenarios that include both high greenhouse gas emissions and strong climate change. Yet, despite the effect on grain crops, the research shows that emissions mitigation will not be more costly or difficult, compared to similar scenarios without these agricultural impacts. "Grass crops grown for bioenergy appear to be resilient to climate change, which is good news for mitigation efforts that may rely on bioenergy crop production and use," said Page Kyle, research scientist at PNNL, working at the Joint Global Change Research Institute, a partnership between PNNL and the University of Maryland. Why It Matters: Food, water, energy production—the impacts of climate change will affect these and all areas of the economy and human circumstance. So slowing down climate change will involve more than one mitigation strategy. To understand the most effective path to reduce the amount and speed of climate change, scientists are funneling world economic, energy and ecosystem data into integrated assessment models to come up with possible futures. Without a model-based analysis, it would be difficult to gauge the extent that possible emission mitigation strategies are themselves vulnerable to climate change. For instance, a robust agricultural sector will be necessary for a transition toward an energy system that is more reliant on bioenergy and less reliant on fossil fuels. However, if agriculture is strained by climate change, such a transition may not be effective for reducing emissions. In this study, researchers are solving those puzzles, piece by piece. Using unique modeling tools, they are developing a method to conduct this complex analysis between the natural world, the climate and the human factor. Methods: The study closed a loop of inter-model comparisons conducted in the past five years, in which models of different disciplines passed information amongst each other to generate a coherent picture of the future. Taking into account complexities of interactions among the human and natural systems, the researchers used PNNL's Global Change Assessment Model (GCAM), an integrated assessment model that takes into account all sectors of the economy in producing possible ramifications of proposed climate mitigation strategies. GCAM used the yields from a global gridded crop model (Lund-Potsdam-Jena managed Land Dynamic Global Vegetation, Agriculture and Water Balance Model, or LPJmL), which in turn used the climatic outcomes of a global climate model (HadGEM2-ES), which in turn used the future greenhouse gas emissions from integrated assessment models, of which GCAM was one. The researchers found negative biophysical climate impacts for major grain crops, particularly in tropical regions. This held strong particularly in scenarios with high emissions and a high degree of climate change. However, bioenergy grass crops look resilient to climate change. This resiliency means that agricultural climate impacts do not pose a serious threat to pursuing greenhouse gas emissions mitigation, which likely will partially rely on bioenergy crop production and use. Even with climate impacts, the research shows there is still a prominent role for bioenergy in emissions mitigation. However, the climate impacts on grain production will nevertheless require adaptation measures such as increased trade or changes to management practices. Though the study does not assess the uncertainty bounds, which are likely to be large, it develops a method for conducting this type of analysis that will likely prove useful to other researchers. What's Next? There are three research themes currently under way. The team will increase the number of crop, climate and integrated assessment models used to narrow the range of uncertainty. 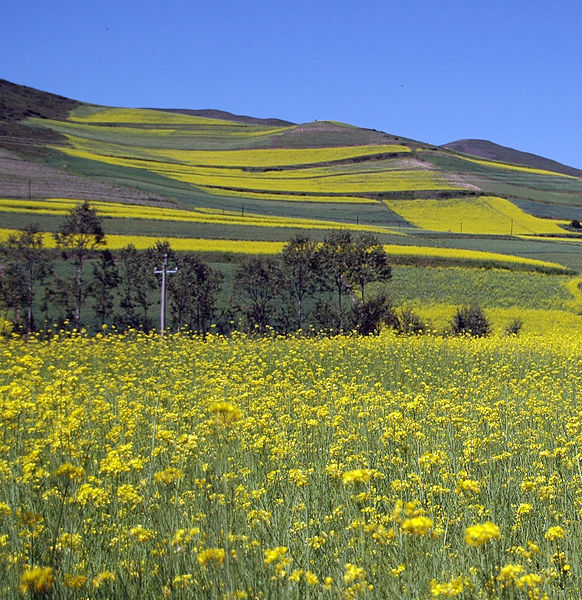 A second project will improve and harmonize the assumptions in crop and agro-economic models taking into account future agricultural management practices. Finally, researchers are developing a simple set of equations to predict future crop yields for any future level of temperature, precipitation, and carbon dioxide concentrations. The goal is to eliminate the need to run a global gridded crop model to analyze yield impacts. Sponsor: This research was supported by the Office of Biological and Environmental Research of the U.S. Department of Energy (DOE) as part of the Integrated Assessment Research Program. GCAM was developed at PNNL with long-term support from DOE's Integrated Assessment Research Program. Research Team: Page Kyle, Kate Calvin and Allison Thomson, PNNL; C Müller, Potsdam Institute for Climate Impact Research, Potsdam, Germany. Reference: Kyle P, C Müller, K Calvin, and A Thomson. 2014. "Meeting the Radiative Forcing Targets of the Representative Concentration Pathways In a World with Agricultural Climate Impacts." Earth's Future, early online. DOI: 10.1002/2014EF000020.